Our fun new phone holders make for a great desk gift. These can hold any device up to 7 1/2" wide. iPhone pictured is not included. 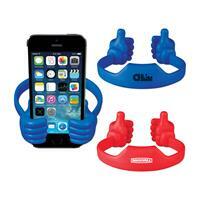 A perfect item for ultimate brand awareness and functionality. This phone ring clip is durable and has a strong stick. A fun idea for giveaways or company gifts. Available in two colors: Red (S21247X) and Blue (S21246X). One location imprint only. Ultimate security for your credit card. 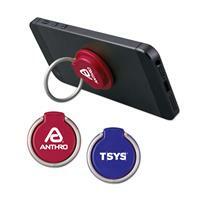 R.F.I.D offers protection to keep IDs and credit cards safe. 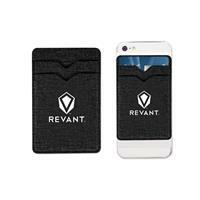 Card sleeve makes a wonderful item for any tech-savvy person! Can hold up to 2 cards. One color/location imprint only. Our mobile phone pocket sticks to the back of your phone. Great for carrying ID cards, card keys, credit cards and licenses. 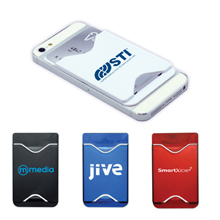 Great for trade shows and company giveaways.Holds 2 cards. Great for carrying ID cards, card keys, credit cards and licenses! Available in black (S21092X), translucent blue (S21089X), translucent red (S21090X), and white (S21091X). Clean your screen with our microfiber cloth. Lift dusts and oils from screens including computers, tablets and smartphones without the use of chemicals. Also useful for cameras, binoculars', glasses & other delicate surfaces. Includes pouch to hold cloth. 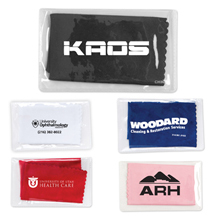 Imprint on the pouch and let your logo be seen! Available in black (S70573X), blue (S70405X), pink (S70574X), red (S70404X), and white (S70403X). 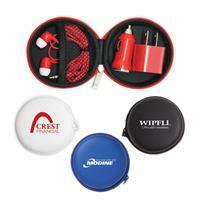 This portable power travel case comes with a USB plug-in charger, USB car charger and ear buds. All stores neatly into a sturdy travel case. Ideal for travel agencies & company events. Available in 4 colors: Black (S80037X), Blue (S80012X), Red (S20013X), and White (S80038X). Due to state regulations, we are unable to ship this product to California. This Bluetooth headset comes in a case with a zipper and is a fantastic promotion for traveling companies, music companies, offices and more! A great tech item to help you get noticed! 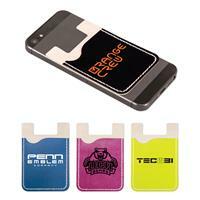 Our cell phone wallet sticks to the back of your phone. Great for carrying ID cards, card keys, credit cards and licenses. 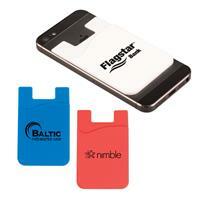 Great for trade shows and company giveaways.Holds 2 cards. Available in blue (S21173X), red (S21174X), and white (S21175X). One color imprint only, black or white ink only. Our faux leather cell phone wallet sticks to the back of your phone. Great for carrying ID cards, card keys, credit cards and licenses. 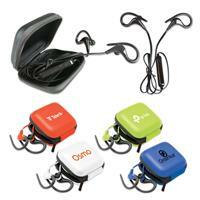 Great for trade shows and company giveaways. Holds 2 cards. Available in black (S21190X)), blue (S21189X), green (S21192X) and violet (S21191X). One color imprint only. Our C-shaped tablet/phone holder keeps your electronics propped up for easy viewing of incoming texts and more. 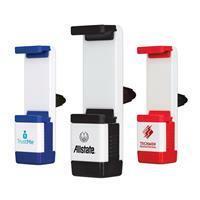 Add your custom imprint and give away at tradeshows and fundraisers. This virtual reality viewer uses your mobile phone to create the ultimate 3D experience. Perfect for movies, games or photos, this viewer has folding sides to pack neatly!